Are you looking to ride where no one you know has ridden before? Looking to lay fresh tracks on a perfectly groomed ribbon of bliss? Looking to have one up on your buddies by visiting a snowmobile destination that none of them will have even heard of yet? Algoma’s all new North Shore Loop is the perfect place for the weekend warrior. Ride from St. Joseph Island (D107) back to the D Trail then right on the D106 to the F Trail back into Elliot Lake (237km). If starting from Sudbury simply follow the D Trail to Elliot Lake or Blind River (BR4/BR3 trail). This will add 2 days to the trip. It’s recommended to stay in the Blind River area the first night then Elliot Lake upon the return to Sudbury. St. Joseph Island Loop – Add approximately 140 km to the North Shore Loop by taking a spin around St. Jo. Like all islands, time stand still and you will be lucky to see another sled on this route. Lots of wildlife and 2 ice crossings keep things interesting. The International Ice Bridge to Drummond Island is commonly referred to as the Christmas Tree Trail. This 18 km (11 mile) ride usually opens mid January and closes late March (depending on ice conditions) and spans between St. Joseph Island and the Drummond Island Yacht Haven Dock. Old Christmas trees line the entire route, placed every 1/8th mile, with reflectivity added for safe night crossings. Riders in both directions must check in with Canadian and US customs and carry the appropriate identification for international border crossings. I would also like to receive a 2019 Algoma Travel Guide. You will need a passport to enter and leave Canada. Your sled must be licensed and insured. 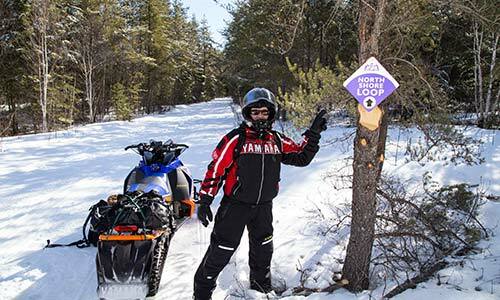 You must have an OFSC Trail Permit on your sled to ride in Ontario. Get a copy of the Algoma Snowmobile Map before you ride. © 2019 Algoma Kinniwabi Travel Association. All Rights Reserved.